As the hike gets tougher, so does finding the time to write about it. Although not as difficult as yesterday, today’s hike still took us almost ten hours to cover the 14.7 miles. 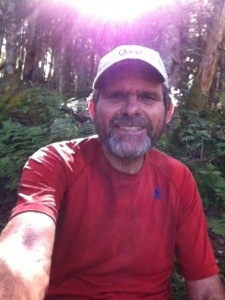 With a fairly flat path over the final eight miles, I actually felt like I was hiking again rather than rock climbing. For the first time in the last week I didn’t have to watch my feet hit the ground with every step. At one point Slim and I even engaged in a conversation for a couple of miles. Lately it’s been almost impossible to hike (rock climb and rock scramble) and talk at the same time. feet in less than an hour. Unfortunately cloud cover prevented us from experiencing a view. 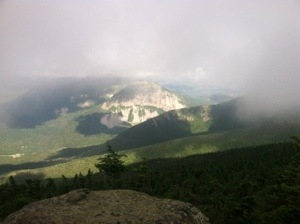 From South Twin we had to walk over a short boulder field before reaching another 4000 footer, Mt. Guyot. By this time the clouds had dissipated enough for a view to the west. From Mt. Guyot we descended almost 2000 feet to Zealand Falls Hut where we stopped for lunch. Several day hikers and section hikers were milling around. 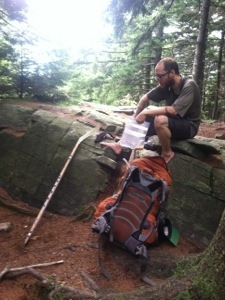 One hit us with a barrage of questions after discovering that we were thru hikers. Banzai answered most. The questioner said, “That’s amazing!” approximately 87 times during the ten minutes of interrogation. Like so many others, he and his wife marveled at what we are doing. No one yet has looked at me and said, “That’s insane.” I kind of wonder why. The hut crew offered us some complimentary soup since we were thru hikers. I declined but the others accepted their generosity. I’ve never much cared for black bean soup. 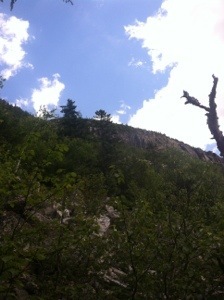 When we finished lunch, we embarked on the final 7.9 miles to Crawford Notch. 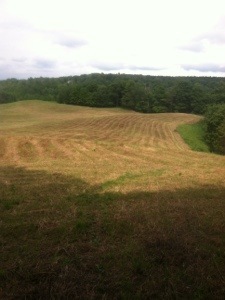 With the gentler terrain we soon realized that we would be finished much sooner than originally anticipated. Along the way we met a southbound thru hiker from Georgia. A recent graduate of Emory in Atlanta and a Braves fan, Gospel plans to go into the ministry in the United Methodist Church. Gospel is the first hiker I’ve met from my home state in a good while. Other than a few day hikers and a couple of trail runners, we saw no one. One young lady with two beautiful, well-behaved labs, met us twice, having been hiking on a loop course. 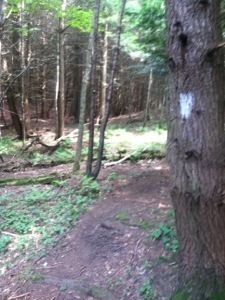 In the Whites there are numerous trails that meet with the AT at various junctures. 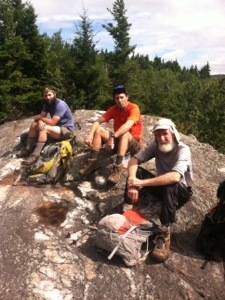 So with comfortable temps and hike-able terrain, my buddies and I reached Crawford Notch before five. Mike was waiting to drive us to Gorham for a meal and a room. Our shuttler and support person has to leave us tomorrow, so we will then have to go back to hitching rides and using shuttle drivers off the thru hiker list. It’s been good having Banzai’s brother for the past two weeks, but now he must return to the regular world. In some ways I’d like to join him. That time, however, will come soon enough. For now the presidential range awaits as Banzai, Pilgrim, Slim and I meet Jackson, Pierce, Eisenhower, and Monroe tomorrow on the Appalachian Trail. 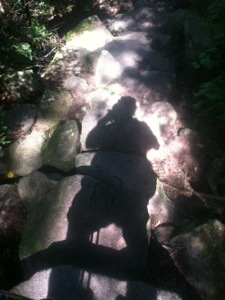 Tuesday, July 30….”Ahhh MAN” is a favorite expression of mine when something really spectacular occurs on the trail. 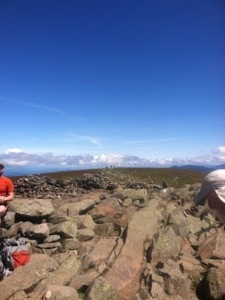 Today I uttered the expression multiple times as I summited three 4000 footers and walked along the Franconia Ridge. I may have to check a thesaurus to fine more descriptive adjectives for the views I have had the privilege of observing over the past three hikes. 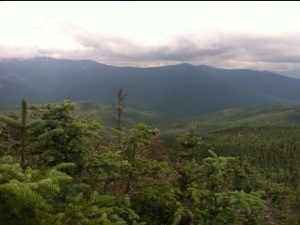 Breathtaking, spectacular, awesome, and majestic just don’t seem to do justice to the White Mountains of New Hampshire. These mountains are beyond description. Today I felt like I was a part of a postcard for much of the morning. 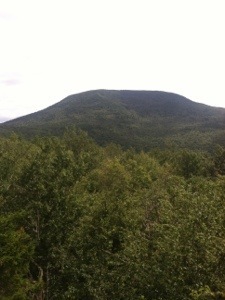 I just hope my pics in some way capture the grandeur of where I am hiking. 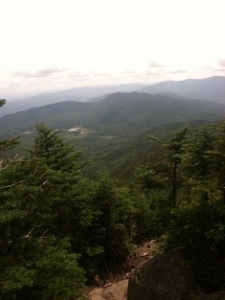 Before Banzai, Pilgrim, Slim, and I even began our hike, we had to walk a one mile side trail back to the AT. These extra miles don’t count for official mileage, so our total AT mileage for the day was 13.0. Like Sunday, the miles were rough. In fact, it took me almost twelve hours to compete the hike. With continued difficult, at times treacherous terrain, by he end of the day I was drained both mentally and physically. A 13.0 mile day used to be a nero. I could hike that mileage and have half the afternoon free. In the Whites, however, I’m exhausted after completing the day. When my buddies and I did reach the trail we were immediately greeted with almost a 4000 foot climb to the Franconia Ridge. With a fairly navigable trail early in the morning, we made good time to the Liberty Springs Campsite. Cam, a caretaker at the area, emerged from his tent to give us some information about the trail conditions. 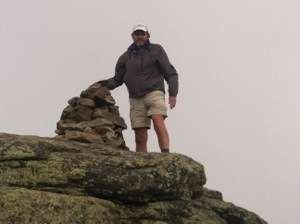 From there we continued the pursuit of our first of three 4000 footers, Little Haystack. Totally overwhelmed with the surrounding beauty, I shot some video as I exclaimed my first, “Ahhh MAN.” With the wind blowing at a predicted 35 miles an hour, I put on my rain jacket and later gloves. At one point the wind actually blew me over. 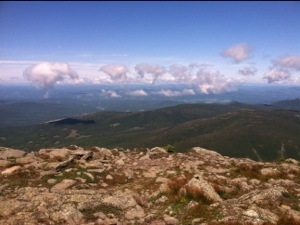 After Little Haystack we walked along the Franconia Ridge to Mt. Lincoln at 5089 feet and then Mt. Lafayette at 5289. We all paused often and took numerous pics along the ridge line. 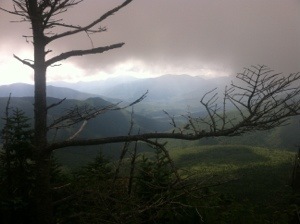 Even though we were sporadically in the clouds, views prevailed in most directions. I literally felt like I was on top of the world. It was beyond exhilaration. A few section hikers were hanging out at the summit including a hiker from Ireland who was hiking with a man from Montreal. 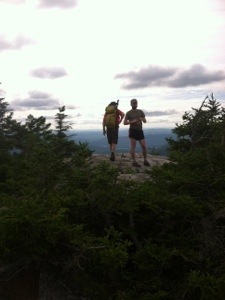 We also saw thru hikers TK and Mountain Goat. Later in the day I would see Roadrunner, a hiker who had started from Springer two days before I started, but that I had not seen until Saturday on Moosilauke. The ridge walk was by far the highlight of the day. Unfortunately, we eventually had to come down from the ridge and reenter the trees. The trail then became another time consuming sea of large rocks. Some required precise maneuvering in order to get down the wet slabs. Interspersed were some uphill sections which required rock scrambling. These weren’t as difficult as Kinsman, but they still demanded focus and concentration. The most challenging section for me came after the fourth 4000 footer of the day, Mt. Garfield. After the climb we encountered a very steep, precipitous descent. With numerous wet rock slabs to negotiate, I had to sit on the seat of my pants and inch my way down on a couple of occasions. The treacherous descent took its toll on me. Feeling mentally fatigued, my pace slowed radically. 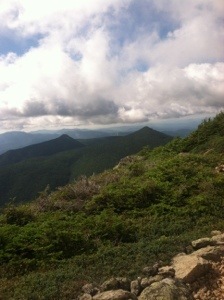 In the afternoon Banzai hiked on to Galehead Hut, hoping to get a work for stay at the AMC maintained facility. 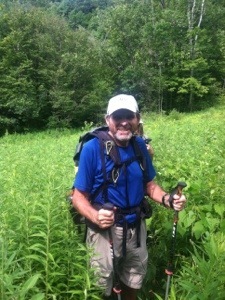 Eventually, Slim also hiked ahead to make sure he, Pilgrim, and I had a bunk. Meanwhile I kept working hard to find ways down the rocks without falling. It proved to be a definite challenge. Pilgrim and I hiked deliberately, finally reaching the hut just as dinner was beginning. It was good to have a solid meal awaiting. The crew members at the hut were most accommodating. Each member introduced him/herself and talked about their most serious injury. They seem to be really nice young folks. 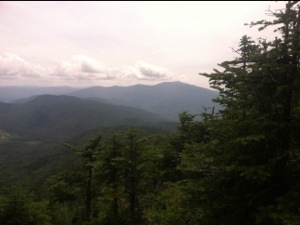 So I have now completed three hiking days in the Whites. By far, they have been the toughest. I’m physically tired. I’m mentally tired. I’m seriously ready for this hike to reach its final destination. The beauty on the ridges easily surpasses the difficulty of the dangerously perilous rocky ascents and descents. 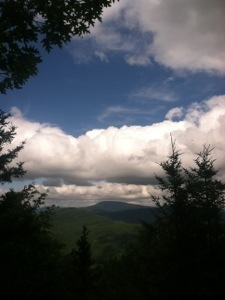 I’ll try to keep remembering that tomorrow as I continue the White Mountains of New Hampshire. I’m OK. If this were easy the success rate would be higher than the usual 20%. 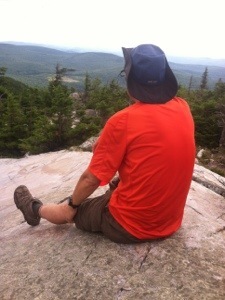 So early in the morning I’ll be at it again as I head toward Maine on the Appalachian Trail. 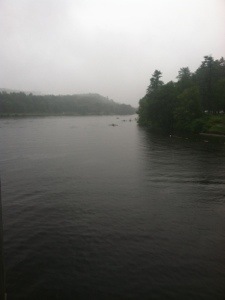 Today as I sit in a comfortable motel room watching a hard, steady rainfall, I’m reminded of what a significant role weather plays in the White Mountains of New Hampshire. If I were on a ridge line in this downpour there would be no escape. I would have to keep walking to the next shelter, which might take hours. So it looks like a day off was a good plan. Still, we will hike tomorrow, hopefully under the forecasted sunshine. On this zero day I’m also reminded of all I have to be thankful for. 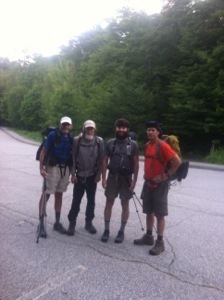 Right now I’m especially grateful for the three hikers who have joined with me for the final push toward the end. Their companionship has sustained me through some difficult times already. Knowing that someone is nearby, just in case an emergency arises, is also reassuring. Hopefully, we can all stay together, healthy and content, throughout the remainder of the journey. The day off has been good. We’ve been able to plan for the next few days and rest. We never know what awaits on any given day. Tomorrow we hope sunshine will prevail and we will have the strength and perseverance to continue the pursuit of a mountain in Maine at the northern terminus of the Appalachian Trail. Sunday, July 28…..For the first time since I began this thru hike of the Appalachian Trail, four months and five days ago, last night I was just too tired to write. After quite possibly the most demanding physical and mental day of any athletic pursuit, I lay my head upon a soft pillow, completely exhausted. I’m still feeling the after effects as I sit under a gazebo at a motel with a view of these majestic Whites. With tired bodies and thunderstorms in the forecast, my buddies and I easily concluded that a zero day was a wise choice. So with 373.1 miles remaining, I’m resting. It feels good to prop my feet up and know that I won’t have to think about every step as I walk today. I’ll try to live normally, at least for a day. Quite honestly, I don’t think Banzai, Pilgrim, Susquehanna Slim and I realized just how challenging the day was going to be when we entered the woods at Kinsman Notch. We knew it would be hard. I just didn’t expect to take 14 hours to walk 16.3 miles. The first surprise came with the ascent of Mt. Wolf. 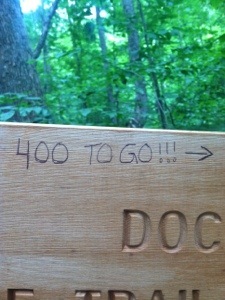 Since Wolf is not one of the 4000 footers, we failed to recognize its difficulty. 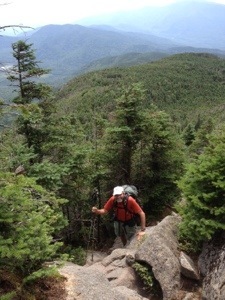 Like so many of the mountains in the Whites, it was more of rock scrambling than hiking. In fact, there was little “hiking” today. When we did rarely come across a seemingly level section, it almost always consisted of large areas of oozing, squishy, black mud. When I put my pole down to check its depth, the mud sucked up one-third of it. Figuring out a path around or finding small rocks or sticks to step on also posed a challenge. Every step of the day necessitated total focus. My brain ached. Not like a headache. It can best be described as mental fatigue. The terrain down Wolf demanded just as much concentration. I kept telling myself to be deliberate. Twice I had near falls but managed to stay vertical throughout the morning. When we reached Eliza Brook Shelter we took a lunch break. Still in good spirits, I didn’t realize at the time that it was going to take me over eight hours to cover the last 8.8 miles. 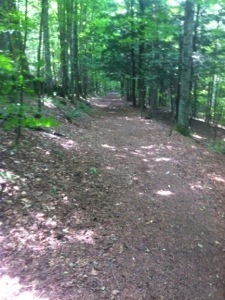 The trail from the shelter parallels Eliza Brook for almost a mile. It also, however, begins ascending again. 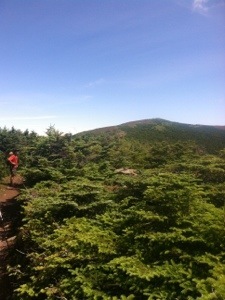 And so we climbed and climbed and climbed up South Kinsman Mountain. My trekking poles proved worthless often since I needed both hands to hoist myself up the rocks. It was hard. At one point I jabbed my neck and scratched my hand on a jagged tree limb as I tried to balance myself near the edge of the trail. Every step required precision. A serious fall constantly awaited. Focus and deliberation were essential. When we finally arrived above tree-line at the summit of South Kinsman Mountain, like yesterday on Moosilauke, the views were unbelievable. It’s like being in an airplane with no fuselage. While we were taking a break, our friend Steady walked up. Banzai decided to hike on with him, so after reaching the peak of North Kinsman a mile later, I wouldn’t see either Banzai or Steady again for the remainder of the day. From the peak of North Kinsman at 4293 feet, Slim, Pilgrim, and I started the slow, tedious, time consuming treacherous descent. It was brutal. At least five times I found myself purposefully on the seat of my shorts trying to inch my way down the perilous, slanted rock slabs. 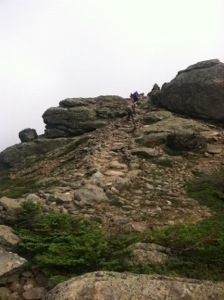 The climb down from Kinsman required as much or more mental effort than physical. At some point Slim also got ahead. By the time Pilgrim and I finally reached the Lonesome Lake Hut, I was spent. Throughout the White Mountains the Appalachian Mountain Club maintains a series of huts that sleep between 30 and 90 hikers. They allow a few thru hikers to work for stay. Otherwise, they cost $98 which is a discounted fee for thru hikers. Amazingly most are full many nights with short section hikers and tourists. When Pilgrim and I reached Lonesome Lake I went in to see if Banzai and Slim were there. They were not. So Pilgrim and I ate a snack and then set out for the final three miles to Franconia Notch. It was already after 6:00. 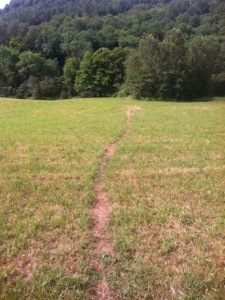 The trail was flatter for those final three; however, we encountered two more obstacles. The bridge over Cascade Brook is out, so we had to figure out how to get across the rushing waters. I first tried the rock hop method but changed my mind when I slipped on a wet one and went down for the first time today. For the third time today I bled. The cut on my knee was minor, but still I set a record for blood during one day. After the fall I just walked through the knee deep water to the other side. 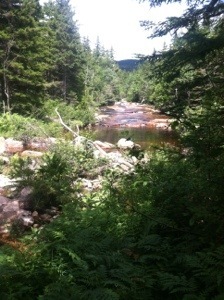 I did the same when we got to Whitehouse Brook, a half mile from the notch. My feet were freezing from the icy cold water. They felt better by the time I arrived at the road. Slim was waiting. He, Pilgrim, and I still had to walk about a mile up a bike path to the Liberty Springs parking lot. So finally my day on the AT had come to an end. It was 14 hours after I had begun at 5:50 in the morning. I had scratches on my neck, right hand, and right knee. Each of my buddies had also fallen at least once. Bruised and battered, we drove through a light drizzle as nightfall arrived. We found a restaurant and then finally settled in at the motel at 10:30. It was a long day, a tiring day, a day that I will remember. A day of rest should help. We are OK. On Tuesday we’ll continue our journey through the Whites, a little more cognizant of the perils that may await. Perils of the trail sometimes, however, are no different than the perils of life. A year ago my brother had one month to live. He struggled daily to just exist. He couldn’t move. He had difficulty breathing. He could do nothing for himself except think. Only he knew his thoughts. 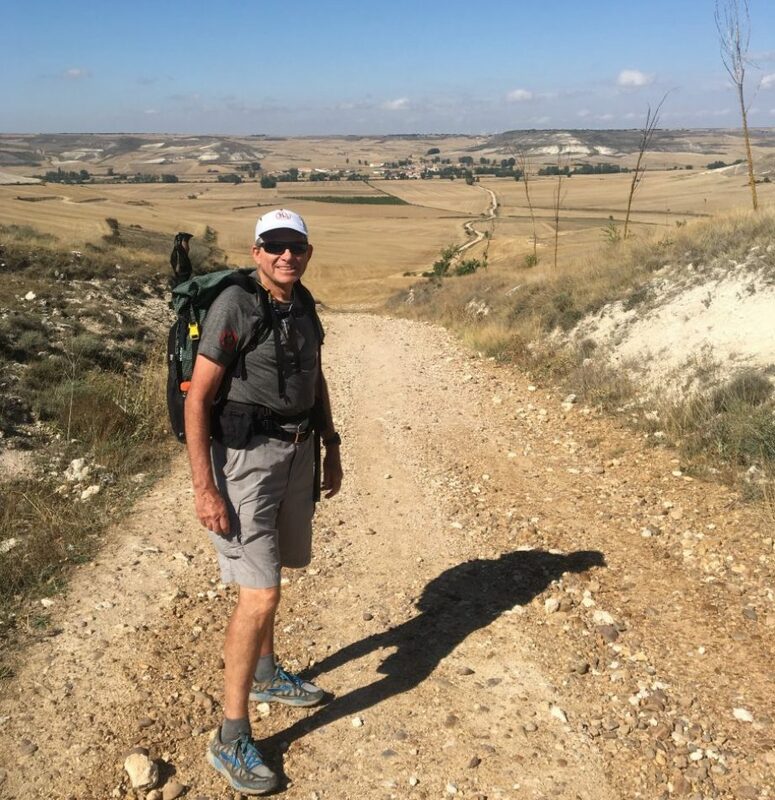 I believe one of my reasons for this hike was to try to find a way to suffer just a fraction of the way Don suffered during that final month of his life. Today was hard, really hard. But what I encountered today pales in comparison to what Don had to undergo that painful last month. There are tough days ahead. There are mountains to be climbed and descended. There are rivers to be forded and nights to be slept in the woods. There is also beauty and tranquility to be appreciated and enjoyed. 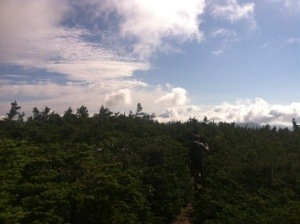 One more month on the Appalachian Trail. 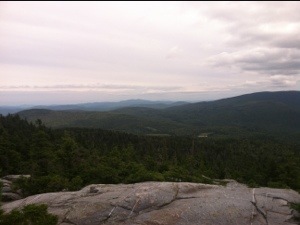 I first hiked in the White Mountains twelve years ago. Today I returned. Filled with a combination of apprehension, excitement, and fear, I accomplished exactly what I set out to do. 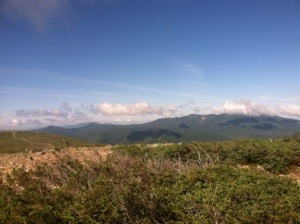 For 9.3 miles I enjoyed the beauty of Mt. 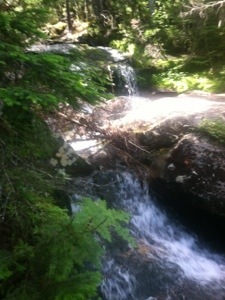 Moosilauke, shared the experience with good hiking friends, and didn’t fall. 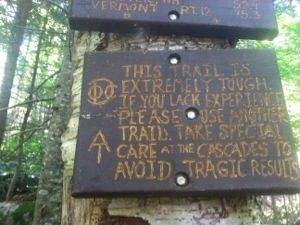 I hiked with caution and deliberation all day, anticipating potential danger and watching each footfall. Even with the careful approach I still had multiple opportunities to pause and admire God’s wondrous creation. Yes, the views all day were breathtaking and beyond. Banzai, Pilgrim, Susquehanna Slim, and I could not have had a better day for our first day in the Whites. It is a day I won’t soon forget. Today was especially important to me because I knew I needed to get past that queasy feeling left over in my stomach from that initial trip here. 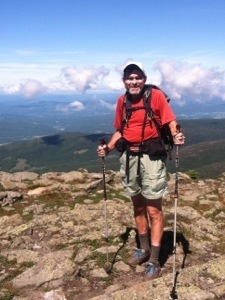 If any of my readers would like a refresher, go back and read my first entry entitled “A Beginning.” The hiker that entered the White Mountains today at 62 differed greatly from the one who struggled to survive a three day trip in 2001. The fear has subsided; however, a tremendous amount of respect will be offered to these majestic mountains each day I set foot in them. They command a certain degree of reverence. Their difficulty supersedes anything the AT has served up thus far. Our day began with a short road walk detour. Due to a swollen creek without a footbridge, the trail had been diverted up NH 25 to High St. From there we entered the woods where the AT crossed. As we entered a section hiker, Step Lightly, was also beginning her hike. We would walk with her most of the morning until the summit. 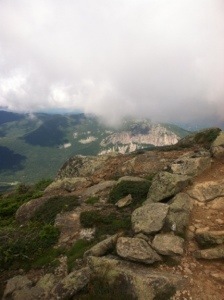 During that time the trail elevates from 1068 feet to 4802 at the crest of Mt. Moosilauke. The gradual ascent did not pose any significant challenge. 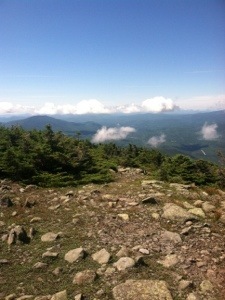 We took a couple of short breaks prior to reaching a 0.1 mile side trail to the south summit. Banzai even chose to do “extra credit” and join Slim and me for the short walk. We all smiled with exhilaration when we first found ourselves above tree-line. It was quite a sight. After retracing our steps to the white blazes, we rejoined Pilgrim and Step Lightly for the final approach to the summit of Mt. Moosilauke. And what an awesome site it was when we got there. 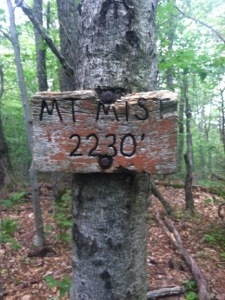 A sign marked the spot of the 4802 foot crest. What appeared to be at least 50 day hikers were just lounging around enjoying the panoramic views. My buddies and I ate our lunch even though it was only 11:20. While relaxing we chatted with several folks who were interested in our thru hikes. One lady had a small black poodle, Duncan, who showed interest in my burger. Step Lightly’s boyfriend, Mark, also arrived after hiking up from the north trailhead. Mike did the same hike as well. 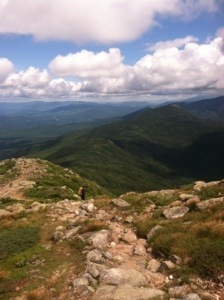 With hikers mingling in all directions and dogs romping, the summit of Mt. Moosilauke took on a party appearance. Eventually we realized that there was still much hiking yet to be done. So just after noon we began the treacherous descent. We have proof of its danger. See the two sign pics at the end of this post. For readers on trailjournals, go to Don’s Brother’s Hike of Hope The first 2.3 miles of the 3.8 mile descent were rather tame. But with 1.5 remaining, the work truly began. 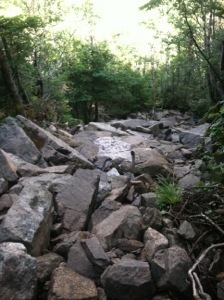 It took me almost two hours to make my way down the very steep, rocky, slippery trail. 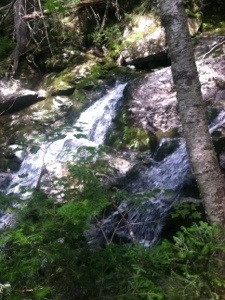 For much of the downward trek, a cascading waterfall bordered the trail on the left. At one point the trail was so close that it may have been tempting for some hikers to reach over and touch the water. Keeping my eyes on my feet, I had no such thought. My only consideration was maintaining focus. I just wanted to stay vertical. During the walk down I was passed by numerous day hikers. All were young. Two couples from the Manchester, NH area hiked near me for a brief time with their dog. Greg, Dan, Carrie, and Jen expressed interest in my hike when I told them I had started in March. Rudy, the dog, bounded down the rocks with an agility that made me envious. Unable to maintain their pace, I soon watched them walk into the distance as I continued to hike deliberately. I was grateful that Slim would occasionally wait on me, often with a warning of an upcoming extremely troublesome area. With a quickly fatiguing brain, I eventually managed to reach the final challenging section which was followed by the road. In the parking lot we visited with Spirit who was waiting on Steady. So my first day back in the Whites can be classified as a success in all respects. I am a relieved, content hiker as I type this. There are still many miles left to be completed and even more difficult and potentially dangerous mountains to be climbed. But for now I’m pleased that I met the challenge of Mt. Moosilauke. All in all today proved to be about as exhilarating as I could have imagined. Tomorrow my buddies and I will continue the hike through the Whites as we work our way through New Hampshire on the Appalachian Trail. didn’t often come up in hiker conversation, Mike said that one could become an expert on anything with a little research. From there he lectured briefly on Faroe, some Scandinavian island near Iceland. Having taught MacBeth a couple of hundred times, I said I suppose I could talk about the Shakespearean tragedy for awhile. Pilgrim said he didn’t know the story of “MacDeath.” Fortunately we were about finished with breakfast as the conversation took the downward spiral. As for the trail today, rocks, mud, roots, leaves, and a minuscule amount of pine straw prevailed. Mud overwhelmingly led the way with roots taking a distant second. Views came in last since there were none on the 9.9 mile section from NH 25A to NH 25. I’m not quite sure why different New Hampshire roads have the same numbers with a letter affixed. It can get downright confusing at times. But before I start rambling too much, there really wasn’t anything noteworthy to report on in regards to the trail today. It was simply more of the same. To relieve the tedium, at one point I was requested to summarize MacBeth. I did so over about a mile. Banzai followed my lecture with a discourse on Job. 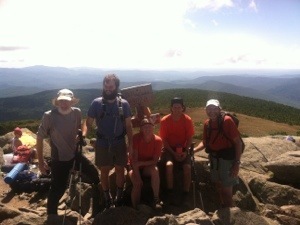 Like most of the past few days, we met some southbound thru hikers. One, Flip, said he got his trail name because he did backflips on the trail, without his pack of course. I failed to mention Puck, another SOBO that I met earlier in the week. Puck carries a hockey stick in lieu of a trekking pole. Almost all of the southbounders have been young men. I’ve only encountered two women and three folks around my age. The closer we get to the end, the more hikers headed to Georgia I will see. Some already look a bit weary. When asked, they also will provide information on what lies ahead. The only problem, however, it that each perspective may differ. For instance, Puck can’t understand why we aren’t all carrying hockey sticks. Throughout the day we only took one break. We did so at Mt. Mist, a spot where section hiker Laura and her teenage son Sam were resting as well. We had seen the duo yesterday. I shared my web page with Laura and listened as she talked about some of her previous hikes including her first climb of Katahdin. From there Banzai, Pilgrim, Susquehanna Slim. and I hiked at a steady, rather fast pace all the way to the road. About a mile before reaching it, Mike met us. He continues to enjoy doing some out and back jaunts for exercise. 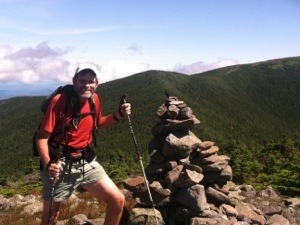 A former collegiate cross-country runner, Mike typically hikes at a pace equivalent to his brother. Before driving back to Lincoln we stopped at a nearby hostel in Glencliff to gather some information about the Whites from Legion, an AT and PCT finisher. When we got back to town we had lunch and visited the post office. Walking around a bit, we ran into several other Northbounders. I hadn’t seen Salad Days and Risk It seen since Daleville, VA. 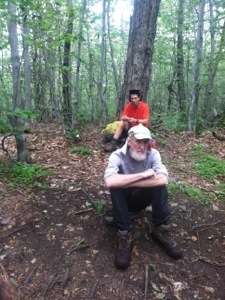 They offered some advice and strategy for our first significant climb up Moosilauke. Sadly, their description of the mountain didn’t alleviate my trepidation. Still it was good to hear the perspective of someone who had just ascended it. So tomorrow we begin the notorious Whites. Like most marathon runners, I have always held the belief that the half way point of the race is 20 miles. It takes as much physical and mental energy to complete the final 6.2 as it does the first 20. 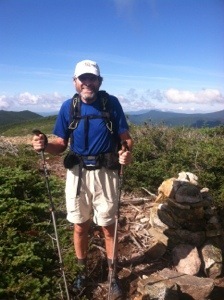 I have now reached the “real” half way mark of the Appalachian Trail. Everything up to this point has been a warm-up for what now awaits. Tomorrow my hiker friends and I will enter the Whites. This is like being promoted from Double A baseball to the major leagues. Where I have been averaging two to two and a half miles an hour, I’ll now need an hour or more just to cover a mile. It’s going to be tough. I’ll also need to be even more cautious as I try to meet the challenge of the White Mountains of New Hampshire with only 398.7 miles left to walk on the Appalachian Trail. After a rather mundane introduction to New Hampshire on yesterday’s hike, my buddies and I got the full welcome on Cube Mountain this afternoon. Finding ourselves close to tree-line, Banzai, Susquehanna Slim, Pilgrim and I realized that the Whites are just around the next corner, or should I say, just over the next ridge. With spectacular views from the south peak of Cube, we took our last lengthy break before tackling the 2000 foot descent over the final three miles. The less severe than we had anticipated terrain helped to alleviate some of the cumulative fatigue from a 16.0 mile, ten hour day. Still, when we arrived at NH 25A, we were all very tired. Our day began at Dorchester Rd. 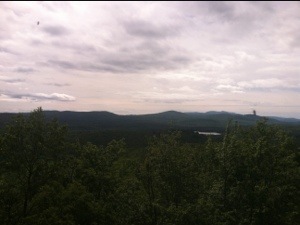 near Lyme, NH. With light packs and cool weather (48 earlier this morning), we scooted up the first significant climb to Lambert’s Ridge in two hours. We were greeted with the first of several awesome views that we would experience throughout the day. Despite having to traverse several large rock slabs, the variation was nice. Large patches of squishy black mud detracted some; however, the somewhat challenging boulders didn’t pose any major difficulty. 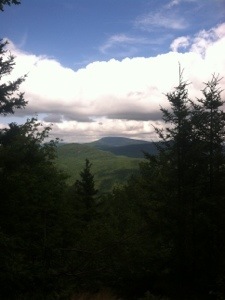 From the ridge we could see our next climb, Smarts Mountain and its fire tower in the distance. The distance between the two locations was only two miles with about an 850 foot elevation gain. Surprisingly the climb didn’t prove to be very difficult. Arriving on Smarts Mountain just past noon, we took a break for lunch. Spoon had also stopped for a break. Slim climbed the tower to the enclosed top. I sat on a rock below and enjoyed a sandwich. At this point in the hike a jovial crowd we were. In fact, Banzai serenaded the rest of us with a chorus of Rawhide as we continued the walk. It appears that this may become our theme song. 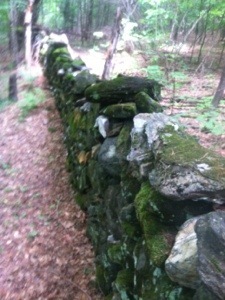 “Move ’em up, head ’em out, Rawhide.” So on we walked down to Jacobs Brook and then on toward the Eastman Ledges. The ledges provided the four of us with some more difficult rock climbs, but the views were worth the effort. 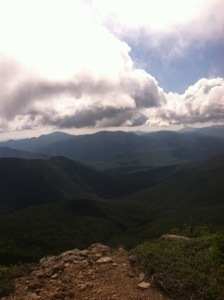 From the ledges we ascended to Mt. Cube where we took a final break on the south peak. 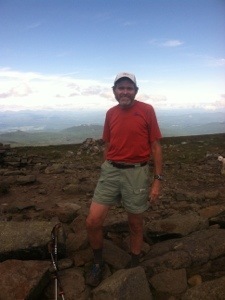 Mike had hiked in to meet us and was waiting at the top with Banzai when Slim, Pilgrim, and I arrived. After hiking tentatively most of the day due to yesterday’s falls, I tried to resume my normal pace for the final three miles. Hiking behind the others, I still exhibited caution. When we all reached the road we drove in to Lincoln where we will set up a base camp of sorts for the first few days of the Whites. Then after a stop for pizza we headed to a motel, tired and dirty after another exhausting day on the Appalachian Trail. 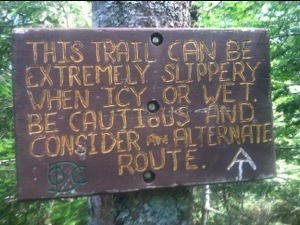 Every day presents challenges on the Appalachian Trail. From rugged climbs to an often continuous sea of roots, rocks, and mud, I have to remember to focus virtually every step of the way. Twice today I lost that concentration and fell. Neither caused any harm; however, each just reminded me of how important it is to watch every footfall. The first occurred when I lost my balance on a wet, mossy rock. I was suddenly staggering forward unable to stop my momentum until I hit the ground. Slippery black mud caused the second. Or should I say my inability to stand on the slippery mud resulted in the mishap. Regardless, I’m reminded that potential danger is always lurking. With the Whites in my immediate future, I best be aware. 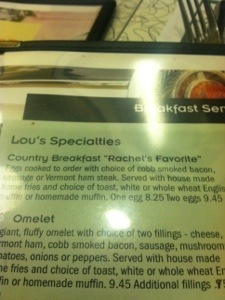 The day started at Lou’s Restaurant and Bakery, a mainstay in Hanover, NH since 1947. Located just a block from the Dartmouth campus, decor in the establishment doesn’t seem to have changed much over those 66 years. The gang and I ate heartily inside before adding a complimentary thru hiker pastry from the assortment outside. 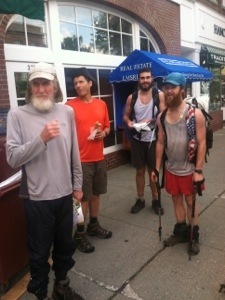 As we prepared to hike on up Main St. (by the way, Lou’s is on the trail), several other hikers walked up including Johnny Walker, Puffy, Spoon, and Gator. We would see all of them throughout the day as we began the first day in New Hampshire. Today’s hike began simply enough. With a road walk up Main St. and then past the Dartmouth football stadium, we didn’t hit the woods again for nearly a mile. Friendly folks on bikes and in cars appeared to be headed to classes or work on a pleasant New England morning. 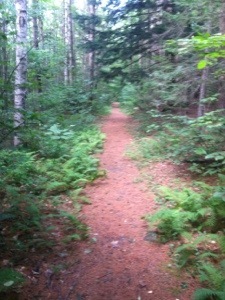 When we did reach the woods, the trail only slightly changed elevation for the first six miles. At that point we commenced the climb up Moose Mountain for around 1500 feet. With less than treacherous terrain, the gradual ascent didn’t pose any real demands. At the south peak Banzai, Slim, Pilgrim, and I stopped for lunch. 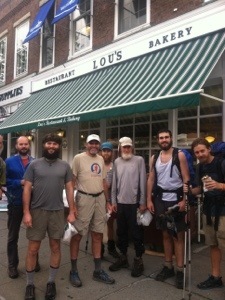 Several other northbound hikers had also taken a break including the group we had seen at Lou’s. Mike was also slack packing Johnny Walker, Puffy, and Spoon. Spoon decided to carry no pack. Banzai put Spoon’s water in his pack. At another break Spoon entertained us (or I should say attempted to entertain us) with a standup routine about thru hiking. The retired postman from Minnesota may have found a new career. 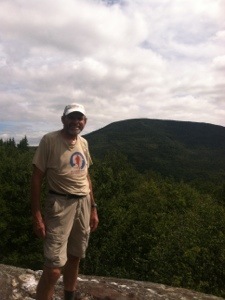 After the show we continued to make good time to the north peak of Moose Mountain and then down to Goose Pond Rd. where a man and woman were cooking some hot dogs for the hikers. Banzai had hiked on with the other young guys, but Pilgrim, Slim, and I each had one. 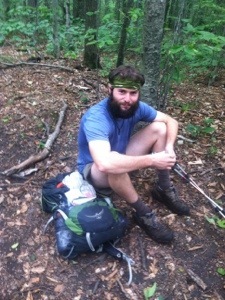 A southbound thru hiker was also enjoying the trail magic. 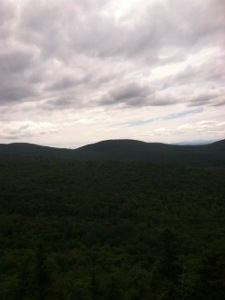 From the road we climbed a steep unnamed mountain to Holts Ledge. I don’t know why the 1000 foot climb over two miles had no name. It surely deserved one. From there we descended to Dorchester Rd. where we ended today’s hike. It was during this last downhill stretch that I had the falls. After going completely through Vermont vertical, it was disappointing to see my streak come to an end. Trying to stay positive, however, I think perhaps someone was sending a reminder that I need to always remain cautious. If there’s one thing I need to do it’s stay on my feet because there are many tough days ahead on the Appalachian Trail. 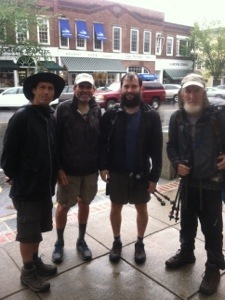 The text message at 6:15 this morning said, “Banzai asks do you really want to hike in this rain?” My response without even consulting Pilgrim and Slim was, “Yes.” With only a 9.9 mile day planned into Hanover, I wasn’t about to let a little rain interfere with reaching New Hampshire. It was only moderate rain. OK, the rain was coming down pretty hard. Regardless, I just couldn’t see forfeiting a day to weather. Slim agreed. When Pilgrim and Banzai finally bought in, we were off to a morning of slogging up the Appalachian Trail. The trail today began and concluded with road walks. As soon as the four of us emerged from Mike’s car we were greeted with a steady drizzle. I wore my rain jacket with a light poncho that also served as a pack cover. Despite both, I got pretty wet as the rain fell with varying degrees of intensity for the almost four hour duration of our hike. 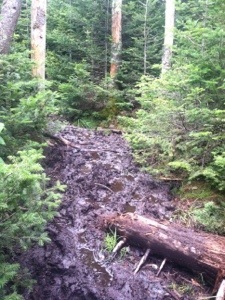 Some of the trail was already saturated; however, the mud didn’t seem to be any more severe than other recent days. We did encounter two swollen streams. At the second I just walked through rather than risking falling on a wet rock. The order in which we hiked varied with Banzai and I alternating in the lead. To take our minds off of the dismal weather I proposed that we sing rain songs. I offered up a verse of “I Wish it Would Rain.” Slim crooned CCR’s “Who’ll Stop the Rain” and then Pilgrim chimed in with “Davy Crockett.” Not quite sure where rain fit in with Pilgrim’s selection. It did lead me to bellowing out a little of “Rawhide.” Rolling, rolling, rolling, keep them doggies rolling, rawhide; through rain, wind, and weather, hell bent for leather, wishing my girl were by my side. Head ’em up, mov’em out, rawhide—-or something like that. Such is life on the AT, especially on a rainy day. Alter my rendition of the theme song from the popular early 60’s western, I decided to put some distance between myself and the others. As I hiked ahead, however, I could hear an ongoing conversation between Banzai and Susquehanna Slim. With a new audience of one, Banzai was on a roll. I only heard bits and pieces of his discourse, but it also seemed that Slim was getting in his two cents worth as well. 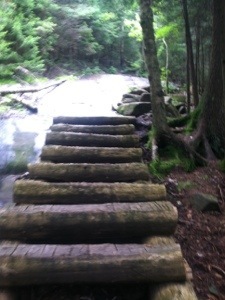 So on I sloshed through the standing water and mud up a quagmire of a trail toward New Hampshire. With minimal rocks and negligible climbs, I pounded out the miles in near record time. Eventually Banzai and Slim caught me. When we reached Elm St., which began a 2.5 road walk into Hanover, we waited for Pilgrim to catch up. Then we walked together as the rain increased. 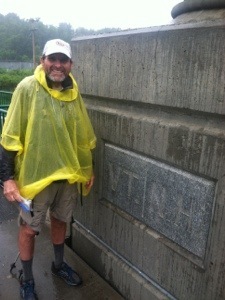 As “Raindrops kept falling on my head,” I thought of another cold, rainy 21 mile day and a green poncho. That was over two months and 1000 miles ago. It could have been yesterday or in another lifetime. 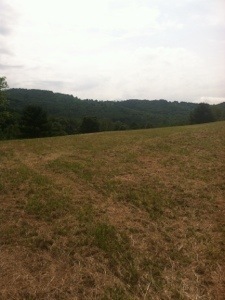 I hiked on toward the Connecticut River and the 13th state of the AT. 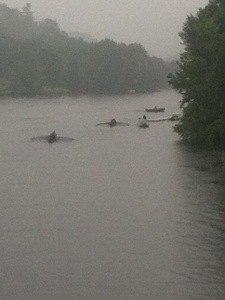 When I reached the western edge of the bridge I noticed several rowing teams. We stopped briefly for the perfunctory picture of the etched VT/NH on the bridge. Even though a steady drizzle continued, I was determined to have this photo memory. After the pics we made our way on up the road into Hanover and onto the campus of Dartmouth College. 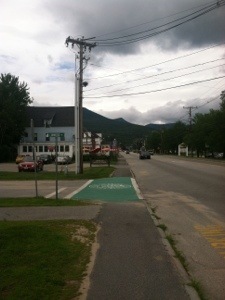 The trail then makes a right turn onto Main St., moving through the center of the popular New England town. Within minutes we had connected with Mike and the car. After a trip to the motel for a shower and dry clothes, we headed back to Hanover for lunch. Tonight we’ve been invited for dinner at the home of Short ‘n Sweet, a section hiker whose son, The Brain, thru hiked in 2007. Over dinner I hope to gain some knowledge of what lies ahead from Short ‘n Sweet and her husband, Graybeard. So tonight, July 23, I’ll celebrate my 4 month anniversary as I enjoy a meal and good company in a home directly on the Appalachian Trail. The Appalachian Trail has sometimes been referred to as ” a footpath through the woods.” After having hiked for almost four months and over 1700 miles, this afternoon I finally found that footpath. Unfortunately, the AT only took this appearance for less than a mile. Yep, just as suddenly as the beauteous trail had appeared, it was gone. From a wide bed of soft, rockless, pine straw, the trail took a sharp right turn into the roots, rocks, and mud that we have been experiencing for most of Vermont. Still it sure was nice while it lasted. Our day began with a stop at a country store for breakfast and a visit to an outfitter in Woodstock for a couple of items. Then at 9:20 Banzai, Pilgrim, and I headed back into the woods. With a shorter 13.9 mile day scheduled, we decided to take the later start and enjoy the day. As usual I hiked behind Banzai from the outset. Pilgrim followed, mumbling “ah, damn,” as we were immediately faced with an almost “straight up” ascent. Even with the climb Banzai talked. I listened until we crested the mountain. Then I contributed to the conversation. As usual, the conversation, like the trail, travelled in many directions. Before long I found myself in a literary discussion. Banzai asked what novels I felt were most significant in AP classes. After mentioning a few, I found myself offering an analysis of Kate Chopin’s “The Awakening.” I’m not quite sure how we got there. I also suggested he read “A Prayer for Owen Meany” by John Irving. We talked of other writers and books for a few miles before he disappeared into the distance. The discussion did make the time go by more quickly and the climbs a little more tolerable. This helped me because I was hiking rather sluggishly from the start. After Banzai pulled away I waited for Pilgrim to catch me which didn’t take long. When he did I commented that I felt like I had been walking uphill for the past two days. Pilgrim replied, “That’s because you have.” At the top of one of those hills Mike was waiting to warn us of some serious boggy mud. All of us tried to circumvent the swamp; however, it was downright impossible to avoid getting our shoes wet. With ankle deep mud and water, as well as head high foliage, we had no choice but to slosh ahead. Finally we again found the woods. When we reached Pomfret Rd., Mike called it a day. 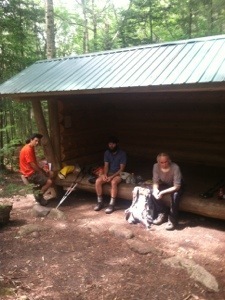 My buddies and I hiked on to the Thistle Hill Shelter where we stopped for lunch. A few mosquitoes made their annoying presence known while we ate. Still we enjoyed the sandwiches and beverages we had brought with us. From the shelter Banzai hiked on alone, hoping to reach the road before his shuttling brother got there. I suddenly felt re-energized, so I also picked up the pace throughout the afternoon. The trail at least provided me with some variety. From open fields to pine straw ups and downs, nothing seemed too difficult. Unlike yesterday, I didn’t feel lonely despite hiking by myself the last three hours. I thought about Owen Meany and his baseball card collection. Tomorrow I’ll walk into Owen’s state. 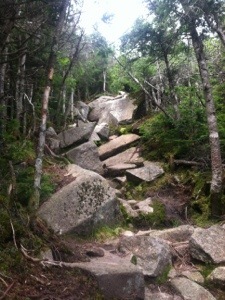 Owen Meany certainly knew what the White Mountains were all about. I hope I can handle them with the same fortitude that Owen Meany displayed when faced with adversity. 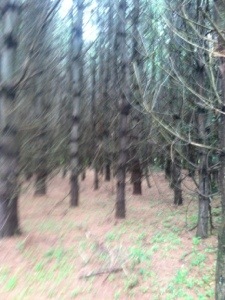 The mind goes to many places while walking solitarily through the woods. When I reached Quechee West Hartford Rd., I stopped to wait for Pilgrim. 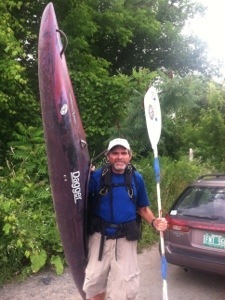 We walked together up the highway to VT 14 where we saw a kayaker getting ready to put in at the White River. I borrowed his kayak for a pic, hoping I would see Steady again soon. Across the road from the river Mike and Banzai were waiting. Apparently Mike had thought this was a better ending location for today’s hike. So our day officially became a 13.0 which leaves a 9.9 to Hanover for tomorrow. And tomorrow begins a new chapter of the DBP (Don’s Brother’s Plan, formerly the DBM). Susquehanna Slim has arrived in White River Junction and will join the caravan tomorrow. Pilgrim, Slim, and I got better acquainted over dinner at a Chinese buffet tonight. 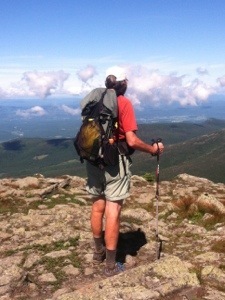 In the morning the journey continues as Susquehanna Slim adopts the DBP for the hike toward Katahdin on the Appalachian Trail.